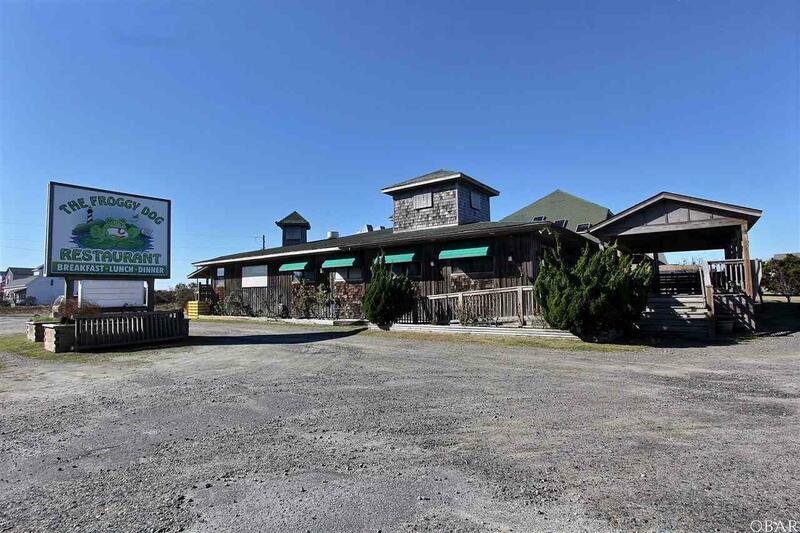 ICONIC HATTERAS ISLAND RESTAURANT - beautiful, all-wood, fully operational restaurant with 7000+ square feet of dining, bar & kitchen area. Currently, serving breakfast, lunch, and dinner. Three (3) separate dining area suitable for wedding/event, hosting & large bar entertainment area. Fully equipped and being sold as COMPLETE PACKAGE which INCLUDES all right, title and interest in and to the FROGGY DOG BUSINESS, i.e., HOBIE, INC. and WINDDANCER, INC., ADDITIONAL LARGE OFFICE SPACE, ONSITE EMPLOYEE EFFICIENCY APARTMENT, GIFT SHOP. Situated on large, corner lot of over 1.2 acres and 255 feet highway frontage. Significant freezer/cooler space, storage areas, and convenient flow space for kitchen and wait staff. MOVE-IN and TURN KEY ready for IMMEDIATE 2019 OPERATION!! !